We have been having so much rain this month that I have taken to carrying an umbrella with me much of the time, including when I am going out with my camera. It’s a challenge to take photos in the rain, because of the juggling required to hold a camera steady while holding an umbrella and also because there are fewer subjects to photograph—most creatures have the common sense to seek shelter when it is raining. Here are a few photos from a walk I took this past Friday at Occoquan Bay National Wildlife Refuge. They are a different style than most of the photos that I post on this blog, but I really like the way they turned out. 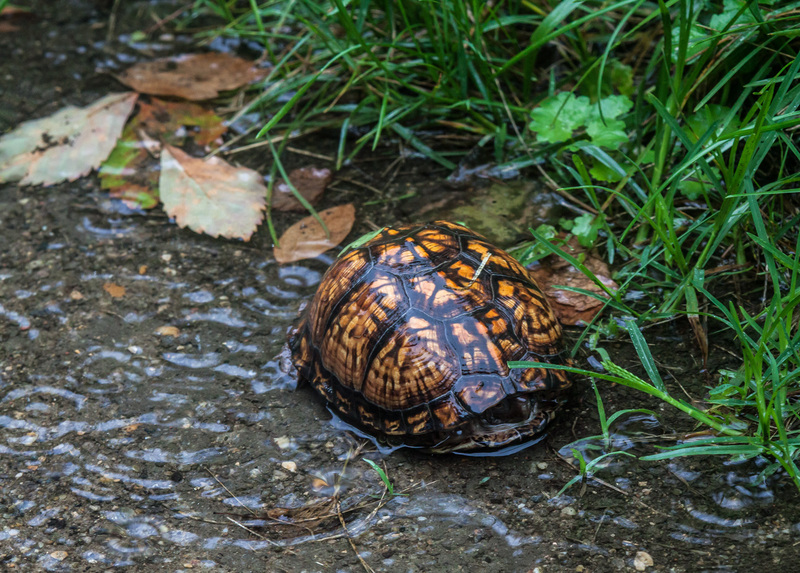 In the first image an Eastern Box Turtle (Terrapene carolina) had a different way for handling the rain than the umbrella I was carrying—it simply pulled its legs and head inside of its shell. 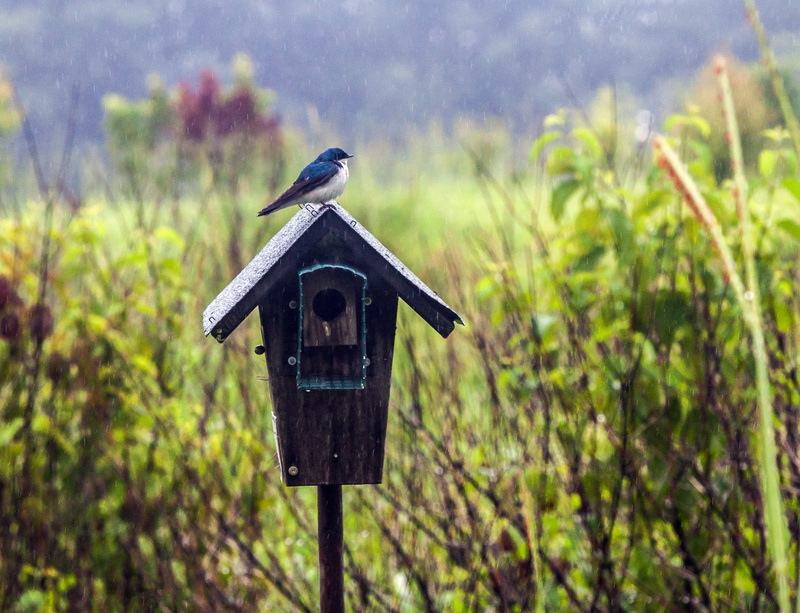 In the second image a Tree Swallow (Tachycineta bicolor) decided to brave the rain to get a breath of fresh air while perched atop a nesting box. 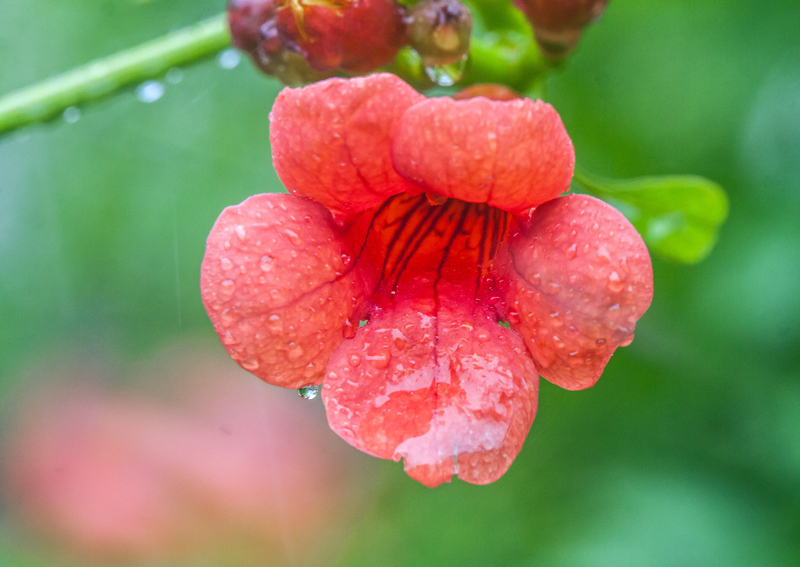 The final photo shows a hummingbird view of a trumpet vine flower, one of its favorites. Alas, no hummingbirds were flying in the rain. Beautiful photos, Mike. I really like the turtle. Thanks, Dan. I don’t see these box turtle very often, so it was a joy for me too to spot this one. This is a beautiful trio of images Mike and I really love each of them. Doesn’t the wet turtle shell look wonderful! Appears like the ground is wet all around the turtle! The turtle was on a walking path and there was accumulated water there. The little concentric circles on the surface of the water were from the large raindrops that were falling. Benjamin thinks that you can’t stay dry and take photos too : “You need two hands on the camera, so it doesn’t get rained on.” He loves the Box Turtle : “The turtle has an umbrella and a house, he’s so smart!” Benjamin likes the “little blue bird and his house.” I think the Trumpet Vine flower with the raindrops clinging to the petals is a lovely photo. Thank-you, Mr. Mike!! It is definitely a juggling act. If I had my really long zoom lens, I probably would have not been able to keep on shooting in the rain, but I had a somewhat shorter lens that I could balance with one firm grip and one partial grip. I was carrying an umbrella and had a pretty long lens hood on lens that I was using, so I managed to avoid both raindrops and condensation.